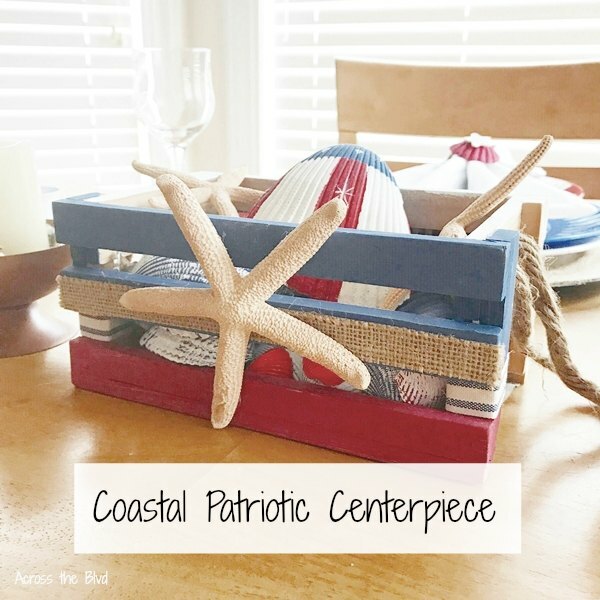 Making this coastal patriotic centerpiece was an easy thrift store find makeover project. 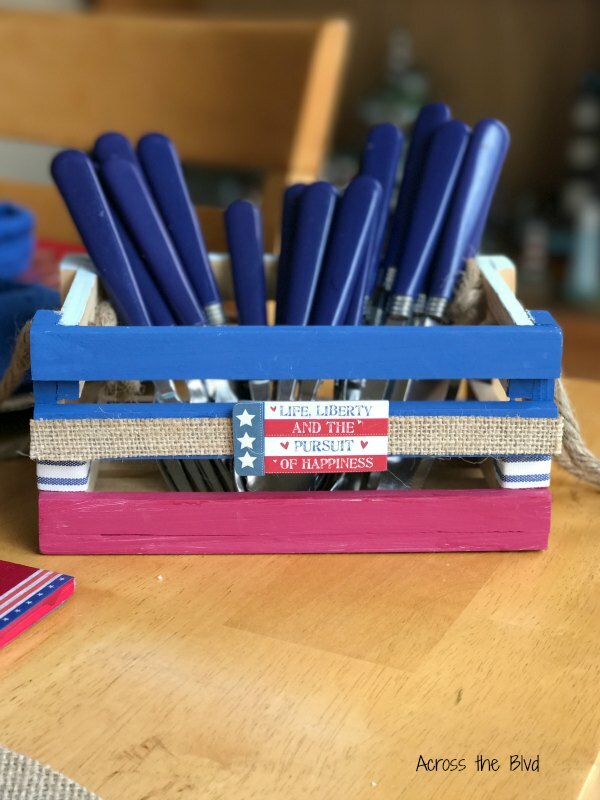 I purchased a wood slat box last year and I gave it a patriotic makeover. I used it as a utensil holder for last year’s 4th of July party. 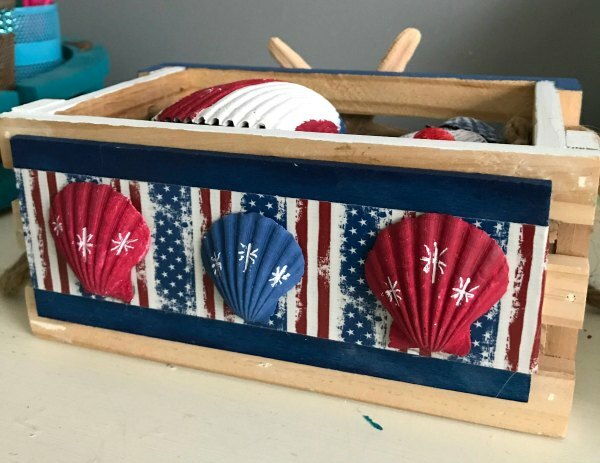 This year, I’m incorporating some coastal flair into my patriotic decor, so the box got a second makeover. This is how the box looked last year after I gave it a makeover. It was a handy way to have utensils out for our 4th of July Party. 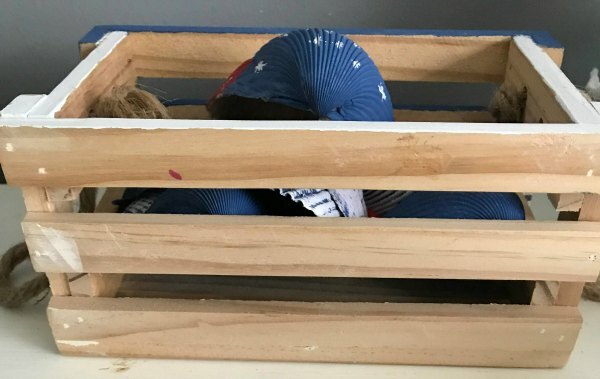 I painted the front slats red and blue with acrylic craft paint. I added some striped ribbon and a strip of burlap ribbon, and a cute scrap booking card stock sticker. The box was unpainted wood when I bought it for a couple of dollars at my local Goodwill. It has rope handles, so it was ready for a coastal makeover. 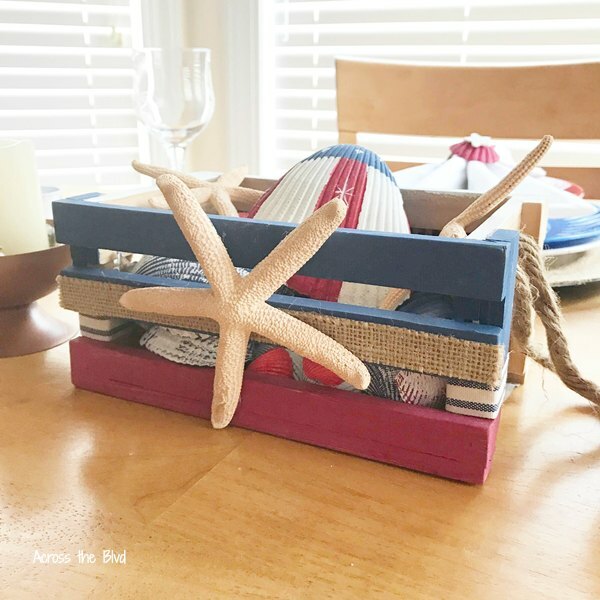 Adding a starfish is an easy way to to keep with the patriotic look and add coastal flair. It’s hot glued in place. For the back of the box, I painted a craft wood rectangle blue and added some patriotic Duck Brand Crafting Tape. I glued three painted shells onto the tape. I used a chalk paint pen to add stars to the shells. To fill the box, I painted shells red and blue. I chose one of the larger shells in my stash to add to the top of the box. I taped the shell into sections and painted it red, white, and blue. It’s always great to find new uses for thrift store finds. 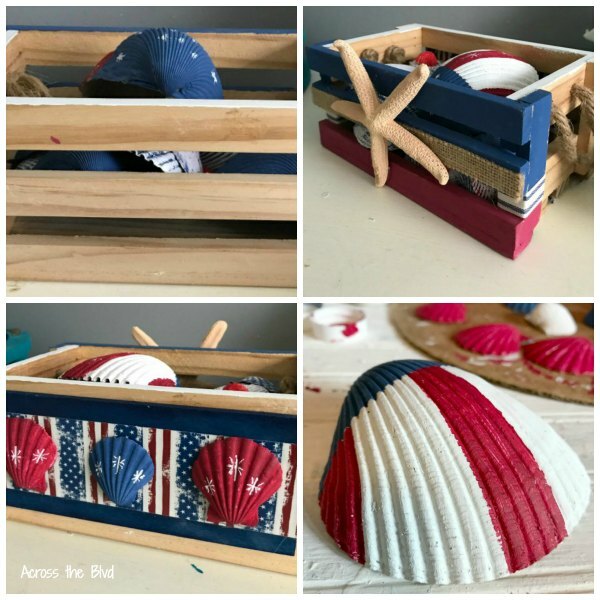 Making a coastal patriotic centerpiece from a thrift store find and using paint and shells I had on hand means the cost was very low. 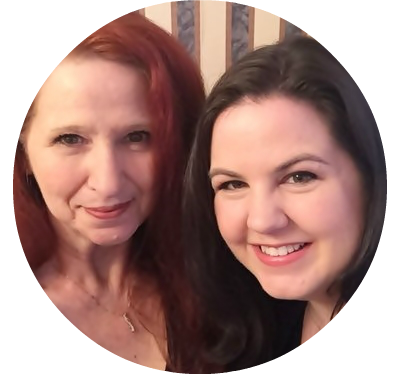 Do you give makeovers to your makeovers? It’s something I do when I want a different look for a piece. What a fun little piece! So many possibilities for it’s use. Really love the shell pattern you did. Thanks, Alexandra! It was a fun thrift store find to makeover. 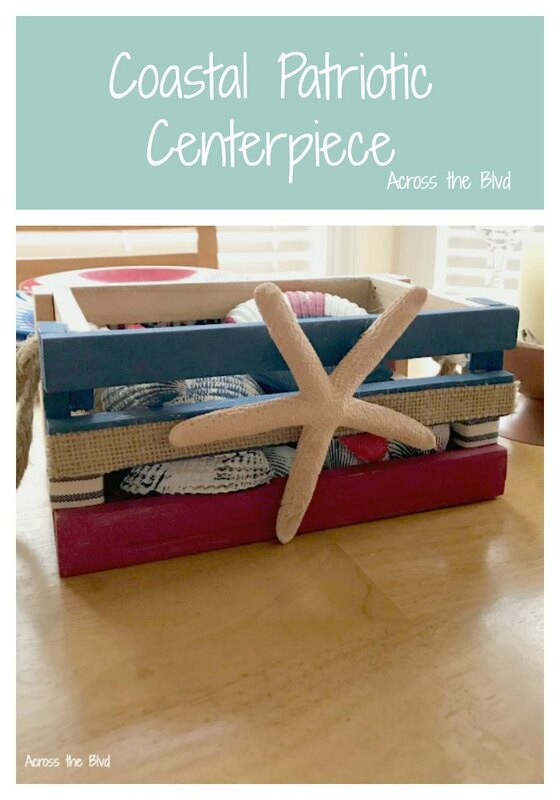 You did a great job doing this coastal centerpiece Beverly. 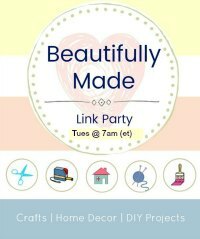 Thanks for sharing it at Cooking and crafting with j & j. Thanks, Julie! And thanks for the party each week! We typically travel South the USA during the Winter. I have never been in the summer and certainly not during your Fourth of July Celebrations. From Canada, it looks like you really celebrate it heartily, and with gusto. Great little craft project. We do tend to celebrate the 4th with gusto! Thanks, Leanna. Thanks, Jenny! I was happy to have found it at Goodwill. 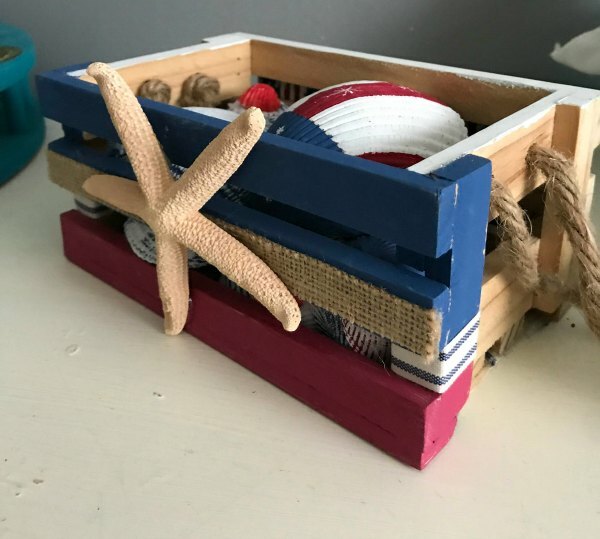 I love using starfish in my coastal pieces. Thanks for the party! Thanks so much, Dee! 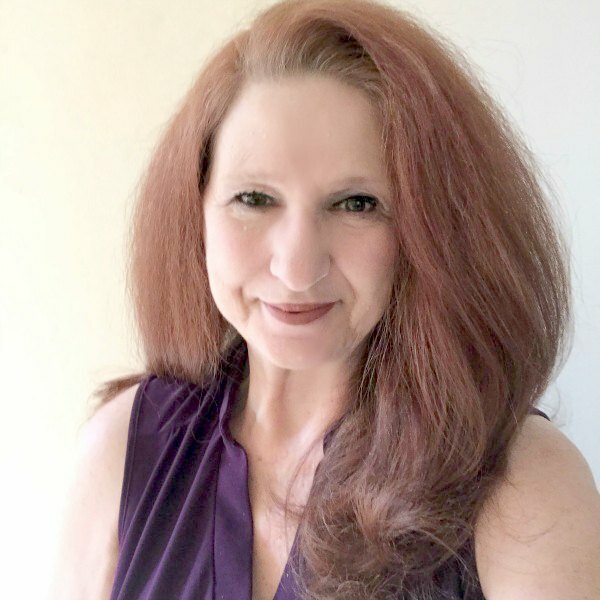 My projects are all designed to be re-created easily. I’m sure you could make some lovely patriotic projects! Thanks for sharing. I appreciate it!